Abstract: This paper details the history of the introduction of visible light curing into dentistry. This history provides an excellent example of ‘out of the box’ lateral thinking translation of innovative scientific technology into dentistry. Visible light curing is an important UK contribution to the recent history and current practice of dentistry, with several million visible light curing procedures being carried out globally on a daily basis. Clinical relevance: Given the importance of visible light curing in dentistry, its history is of relevance. 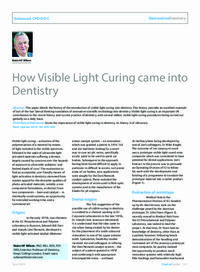 Objective: To describe how visible light curing became a central part of restorative dentistry.